The above map, produced by Data Driven Detroit, comes to us though the satirical Facebook page Michigan Needs More Parking. 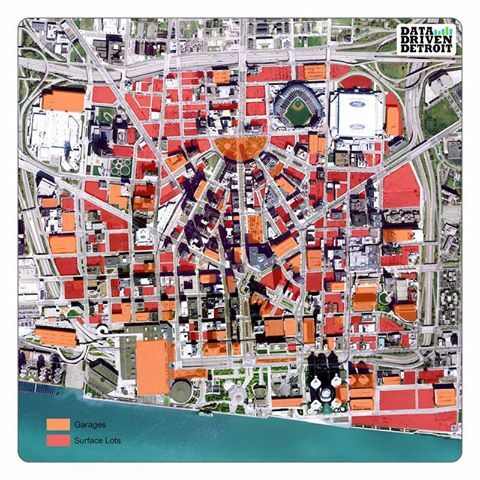 It shows downtown Detroit with parking highlighted in orange and red: garages in orange, surface lots in red. “We must do something about all of these non-parking blocks holding back Detroit,” writes Michigan Needs More Parking. The city is getting ready to decide whether to allow the demolition of a historic bank to make way for, you guessed it, more downtown parking. Whoever is in charge of Detroit’s parking land-use policies needs to read The High Cost of Free Parking. If they’re too lazy to read that book, they can read Contemporary Approaches to Parking Pricing: A Primer by USDOT/FHWA (only 38 pages). Detroit will never bounce back until it replaces its surface lots with both commercial and residential buildings. This is how DC has transformed into an economic powerhouse over the past 20 years. Sadly, this situation is not unique. One can take a picture of downtown Los Alamos and it looks quite the same. Looks like Detroit has a lot of places to park cars, but relatively little to do once you get out of your vehicle. Regarding Los Angeles, I don’t think it’s quite as bad as Detroit, and at least there are subway and light rail lines. I find it somewhat amusing (ironic?) to visit the big LA Auto Show (more for amusement than anything else) by riding electric railway transit all the way from East Pasadena to the LA Convention Center and back for $1.80. Oops! I read too quickly and mistook “Los Alamos” for Los Angeles! We have a Los Alamos in California, too–it’s a small town between Santa Barbara and Santa Maria just off US 101. But it is not free. It is $10 – $20 to park downtown. More on game days. Don’t dare try parking on the street. Yes, the glut of surface parking in Detroit is both unattractive and detrimental to Detroit’s growth. I absolutely hate the area to the left of Comerica Park on this map. What other major city has such a empty, bleak area in their downtown? I’m fine with keeping some of it, but damn, let’s build some nice buildings (and parks) so people actually want to live, shop, and spend time in the city. The City of Detroit Historic District Commission did unanimously vote to deny the application to demolish the State Savings Bank, so common sense wins at the moment. Now we fight the “demo by neglect” battle for this building, with its regressive owner. That is indeed ironic — the Capital City of the most subsidized transportation mode in history — now with excess space for that very transportation — in a dying city, like the cars that made it that way. That bank is a McKim, Mead and White building no less too!!!! Unbelieveable, these neglected Detroit masterpieces would be highly prized treasures in any other city in the US today. Great stunt. We really liked it here in Buffalo, where we invented it in 2003, including the map color scheme. What’s interesting is these auto dealerships in LA along the Van Nuys Blvd. corridor or other corridors want to build bigger buildings to house newer cars off their site and it’s located what is being consider to be a metro line which could be light rail or BRT. I always felt that auto dealerships will eventually die off because we can purchase vehicles thru the internet and these dealership lots could transform itself into mix-used development or open space. The book addresses paid parking too. Basically, allocating tons of space to parking is bad–making it free is even worse. Grand Circus park is now a parking lot? I dont think so. Now I question this entire article. There’s a parking garage under it. Toledo, Indianapolis, Erie PA, etc, etc, etc. The map is deceptive. Parking takes up a lot of space in terms of real property footprint, but too much of it is inefficient. All those lots are only ground floor lots, they are not multiple stories. Detroit really needs mass transit. But if not that, then to use the land better.